Soaring Seagull: 1411 and counting.....It saddens me no end! 1411 and counting.....It saddens me no end! To learn more and to check out some pics of this wonderful cat, click Here and Here. This news will make u happy. Climate change and tigers also found their way into the FM’s speech. The FM suggested the setting up of an institutional mechanism to address issues relating to climate change. 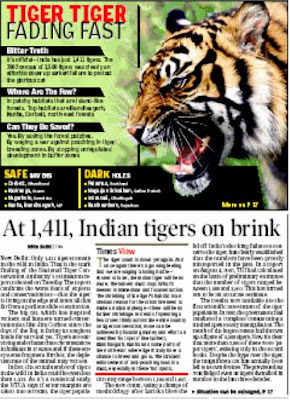 1411 really scared tigers got Rs 50 crore; the money will be used to arm and deploy a special tiger protection force.